Wishing all Redheads a very Merry Red Xmas from Sammy Clause! 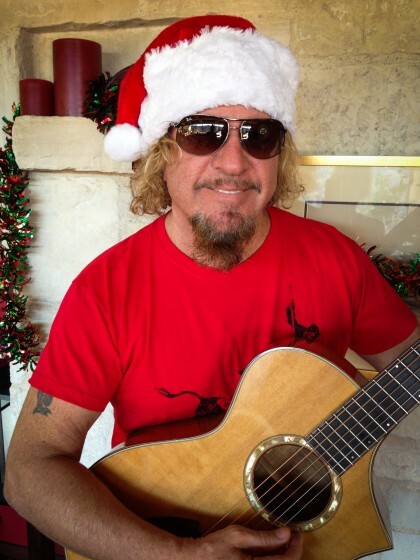 Merry Christmas to our Red Rocker/ Sammy Claus!! Wishing we were in Cabo with you for NYE. Rock the night away! We will be rockin to your music all night long. And cheering with Sammys Beach Bar Rum. It still won't be the same as being there with you. Have a rockin New Years Eve!! How about a 2 or 3 XL Redrocker T shirt, from Sammy Clause. Sammy Clause you delivered on Christmas Day and made me one of many Featured Fan Photos . For this, I thank You! Looking forward to another great year of rockin' with you and all our Red Friends! Merry Christmas!